Volunteered as a family at one of the Beaverton Giving Gardens with the Tualatin Valley Gleaners. The remaining volunteers at the end of our shift. Tired but happy. Today was fun! 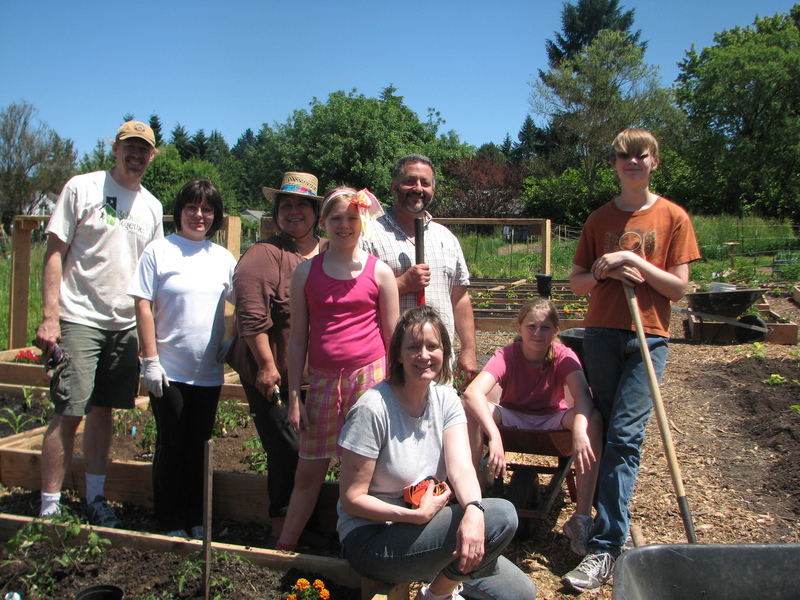 The family spent three hours digging, preparing beds, and planting in one of Beaverton’s community gardens. Everyone worked hard, and although we were all tired at the end of our shift, I think everyone had a sense of satisfaction. I know I did. We took the kids out for milkshakes to celebrate afterwards. Here’s a bit of information on the Tualatin Valley Gleaners. (tvgleaners.org). As part of larger neighborhood gardens, they plant, maintain and harvest fresh (nearly organic) produce and deliver it to places within Beaverton. From there, in conjunction with the city of Beaverton, the food is then delivered to low-income people in the community. They also put out boxes at the Beaverton market for vendors to put their less-than-optimal produce in. Again, the food is delivered to people in need. By helping people eat nourishing meals, they help families focus on other important things rather than where the next meal is coming from. Yet another organization doing good work right here in our community. This entry was posted in In the community and tagged Family Volunteering, Gardening, Volunteering. Bookmark the permalink. What a fantastic idea! Especially considering it is far more expensive to eat healthily these days. That would be very satisfying, I’m sure. It’s fun to discover good and generous things going on right in our communities, right under our noses. I’m hoping that we can help out again some Saturday this summer.